When the app is first downloaded,, it will ask for a cell phone number, age and school. Users don’t need to have a Facebook account in order to log into Lifestage. Once you select a school, if there are less than 20 students using the app, the user won't be able to see any profiles. The user will have to send an invite to classmates to use Lifestage. Once a school has reached 20 students, the school will unlock and profiles can then be viewed. . Just like Facebook, when it first launched only college students were able to log into Facebook using their school email. When the app is opened, the camera will be the first thing seen, just like Snapchat. Users are able to add framed graphics that say “my happy face”, “my sad face”, “dislikes”, “likes”, and many more. On Lifestage, no one can send private messages. Instead, there is a feature called, “Reach Me”, which allows users to add a Twitter handle, Instagram name, Facebook url or Snapchat. So users can contact each other via social media. . 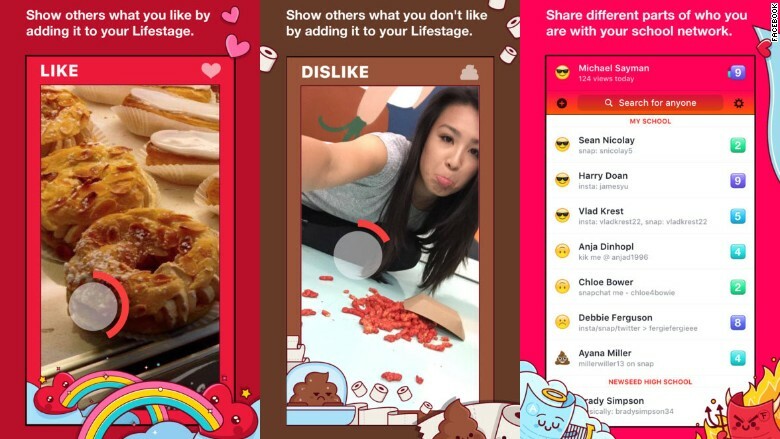 This app seems alluring for teens who want privacy from their parents on social media. And as such,there are many security concerns. Although the app is only for ages 21 and under, users can lie about their age. This allows for anyone to contact minors through the use of fake profiles and without knowing the true age of the person. The app states, “Everything you post in Lifestage is always public and viewable by everyone, inside and outside your school. There is no way to limit the audience of your videos. We can't confirm that people who claim to go to a certain school actually go to that school. All videos you upload to your profile are fully public content.” How many teens will actually read this before downloading the app?. Lifestage is only supported by iOS devices. There is no word on whether it will be supported by Android. The app only has two reviews on the app store, some are calling it “creepy”, others are saying “has a chance to be a hit”. Tweet us at @SocialMediaDel and let us know what are your thoughts on this new app!